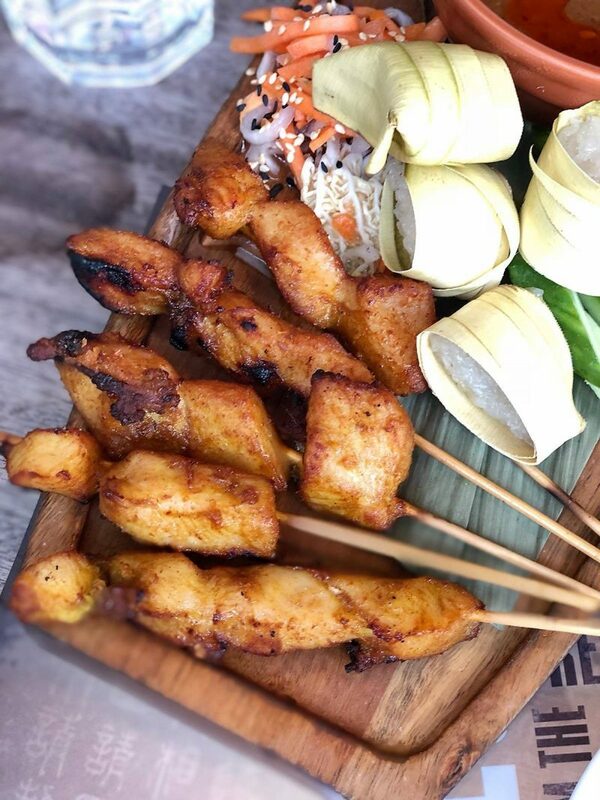 Banana Tree restaurants are the ideal place to enjoy delicious food from Vietnam, Cambodia, Thailand, Indonesia and the peninsula of Malaysia and Singapore amidst the hustle and bustle of the stresses that December often brings. There’s Christmas shopping, plenty of parties, even more sniffles from cold filled colleagues and sometimes all you need is to get away from it all, even if just from an hour. That’s exactly what I did one lunch this week. I met up with my Mum, we feasted on fantastic food and acted like we didn’t have a care in the world. It was so needed! 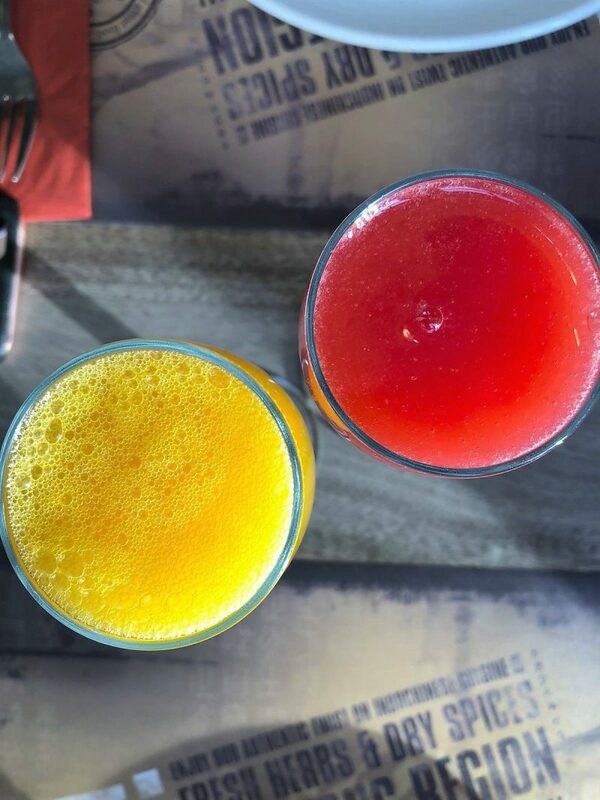 We treated ourselves to a Mango Bellini and a Raspberry Fizz, that were both really good. I could have easily had a few more but being a lunchtime I restrained! There were so many items on the menu that I really wanted to try as it all sounded so good, but we finally made our decisions. 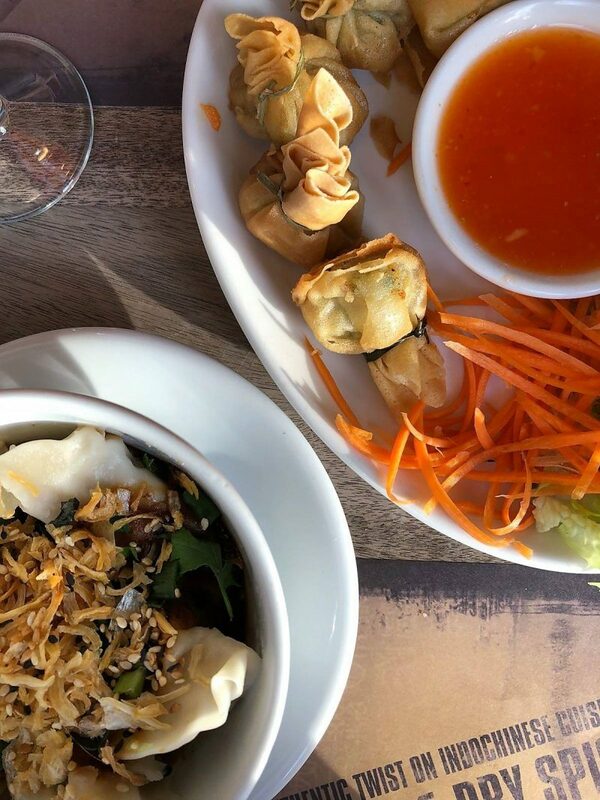 For started we shared the Steamed Chicken and Vegetable Dumplings in Fresh Herb Sauce with vinegar and garlic and the Crispy Seafood Money Bags that were filled with King prawn, white fish & vegetable stuffed parcels, served with a bowl of sweet chilli dipping sauce. They were both really good! I think the dumplings won me over just a little more as I had been craving them recently and they totally hit the spot! 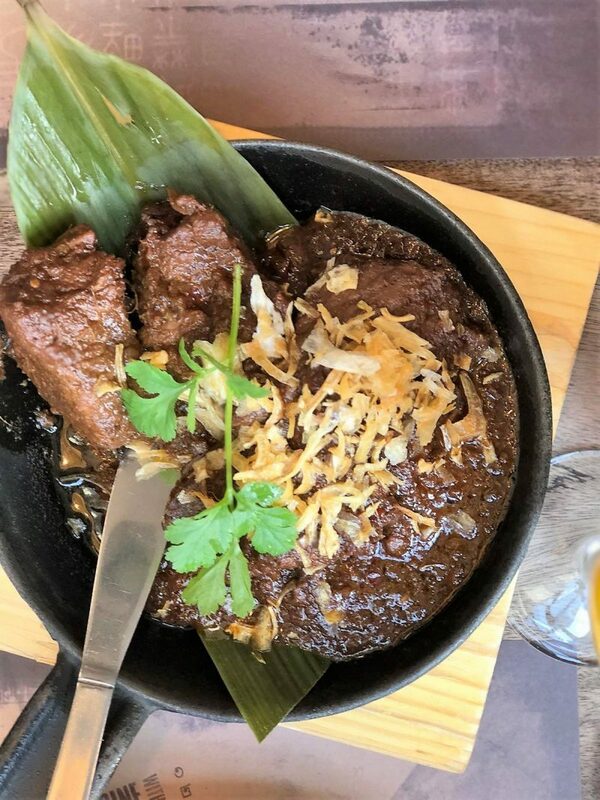 For the mains, Mum picked The Legendary Rendang Curry which is a famous specialty from the Minangkabau Hill tribe of Indonesia. It’s a slow-cooked, dry & fragrant curry dish, that’s also pretty complex. It has a rich & nutty base sauce complete with toasted coconut which takes up to 4 hours to cook. Banana Tree often call it the undisputed ‘King Of Curries’. We agree. The beef fell apart, seriously, you didn’t even a need a knife to eat it! My choice of meat was the Kajang Grilled Satay which is an authentic recipe from the shrine of Satay, the town of Kajang in Malaysia. The barbecued Chicken Sticks are served with steamed Palm Leaf Rice, Cucumber & delicious secret peanut sauce! You can get 5 or 10 sticks, as much as I could have devoured 10 sticks I opted for the 5 as it was only the two of us for lunch! The peanut sauce was so good I was dipping the cucumber in it when I ran out of chicken! For our side style dish we ordered a firm family favourite of Chicken and Prawn Phad Thai. 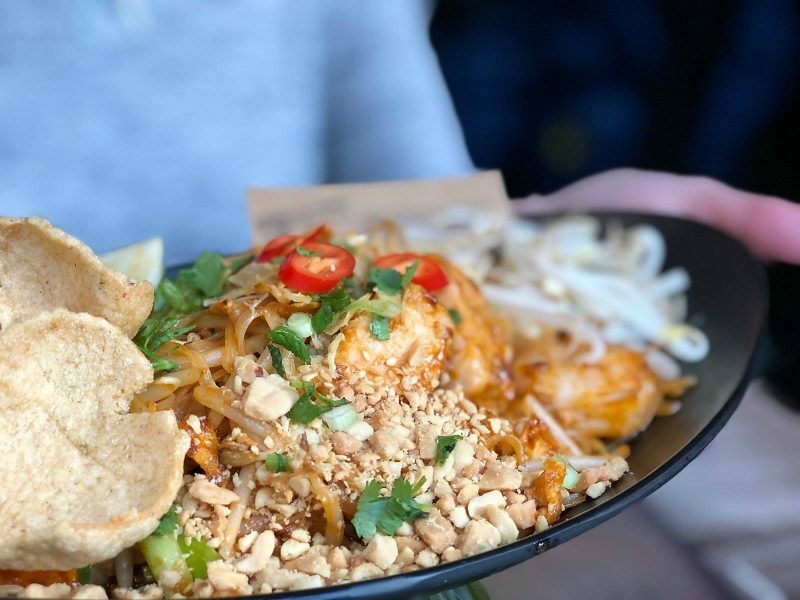 This is a wok fried rice noodle dish mixed in with tamarind, palm sugar & fish sauce, with eggs, bean sprouts, peanuts & crispy shallots & Prawn Crackers. The portion was really generous so we potted some up and took Dad home some so he didn’t miss out on the fun. We were both really impressed with the quality of the food, the atmosphere and how quickly spending time there made the lunchtime zoom on past. Banana Tree have branches all over but their most recent opening is the Chelmsford Branch in Essex. I’d highly recommend stopping by at any of them should you get the chance! "5 Things Not To Miss On Your Trans-Siberian Holiday *"
"My Top Money Saving Tips *"